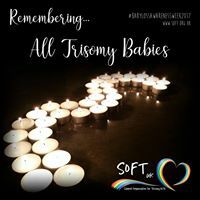 More than 1 in 6 pregnancies diagnosed with trisomy 18 or trisomy 13 end in miscarriage or are stillborn. The experience of miscarriage or of having a baby who is stillborn is different for everyone. What the loss of your baby means to you will be shaped by the person you and and your own circumstances. It may be that others around who have no experience of this find it difficult to understand how you feel. The Miscarriage Association produces a range of information leaflets about pregnancy loss. Topics include talking to children about miscarriage, men and miscarriage, and management of miscarriage. Sands, the stillbirth and neonatal death charity, also produces a range of leaflets and a parents' support pack. These can be downloaded from their website and cover topics including support for fathers, supporting other children, and saying goodbye to your baby.